Mr James Ashbury's 108-foot Cambria, designed and built by Michael Ratsey of Cowes. Ashbury wrote to the New York Yacht Club in the fall of 1868, suggesting that the "Hundred Guinea Cup" later called America's Cup, which had been won some 17 years earlier, be put up as a challenge. For the next two years he held a rather odd correspondence with the NYYC, culminating with his bringing Cambria over to challenge. The NYYC, contrary to what is now "acceptable", put up 23 different boats against him - ie the race was 23 against one - with the sole aim of ensuring that the Cup did not leave the USA. The race was held August 8, 1870, 11:26 am, starting from at anchor, which was then the custom, off Staten Island in New York Bay; most of the local New York boats had an advantage with centreboards over some of the shoals in the bay; some reports have it as being not very gentlemanly, with little respect for right of way, and even a collision or two (one report even has Ashbury injured by a falling topmast from Tarolinta after she hit Cambria). Cambria finished 10th, about 40 minutes corrected time behind Magic (27 minutes 3 seconds elapsed time). 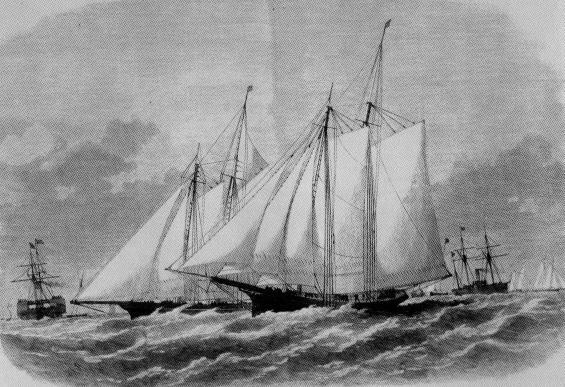 The America, now quite long in the tooth compared to the rest of the fleet, came in fourth and beat Cambria by some 13 minutes and 3 seconds true time. 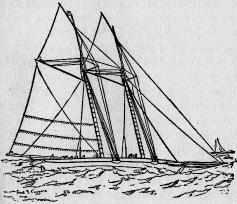 This was the first challenge for the Cup, and was lost by the owner of a relatively slow schooner - attributed more to her rather clumsy rig than to the model of her hull, although her draft was a handicap in New York Bay. Cambria was taken back to England and ended up in the West African trade. James Ashbury also mounted the second (also unsuccessful) challenge with Livonia before retiring to NZ, I think, as an embittered sheep farmer..